I get a ton of emails and I delete a lot of them without even reading… Okay, yeah…. I read the ones that mention food…. anyway…. I’m glad I took the time to read the King Arthur Gluten Free Recipe Roundup last week. King Arthur has a number of really good Gluten Free mixes and flour replacements. Until I discovered Cup4Cup, King Arthur was my favorite GF Flour. I still like their flour, but Cup4Cup comes in a larger package and I think the price is just a bit better. King Arthur has a new Gluten Free Baking Mix. It took me a bit of searching to find it in the store. Our local store had hidden it with the rest of the regular mixes…. I hate that! If you’re going to have a Gluten Free isle…. put everything there. Or just mix the gluten-free stuff with all the regular stuff around the store… not both! Ugh. 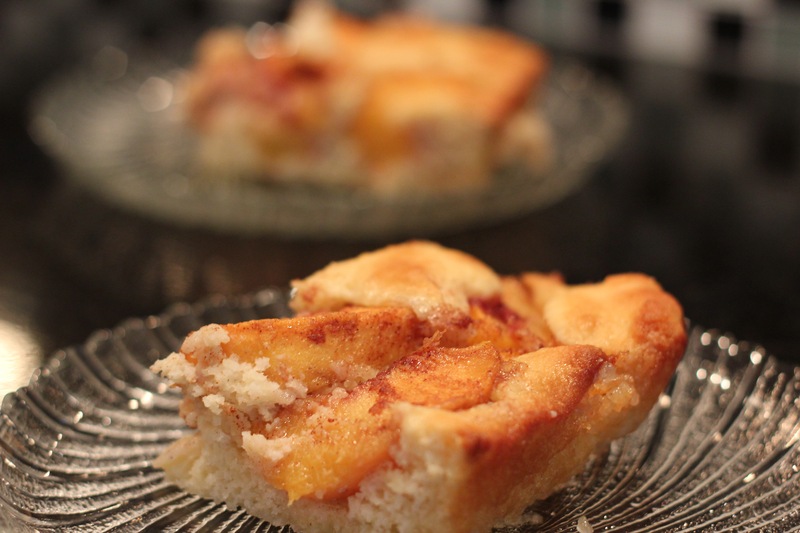 I tried the Gluten Free Peach Cobbler recipe out at our weekly Family Dinner Night. It got really good reviews from the panel.. aka: the Family. Mom doesn’t even like cobbler… or peaches, and she said it was really good. The rest of the crew said that they wouldn’t have know that it was gluten-free if I hadn’t told them. The original recipe suggested using a mix of berries and peaches as an alternative. Blueberries would probably be delish… maybe for breakfast? Hmmm….. oh, geeze…. now I want to go make that for breakfast! The only change I made from the original recipe was to use cinnamon AND nutmeg instead of just one or the other. ‘Cause cinnamon and nutmeg just belong together, right? The cake part of the cobbler came out perfectly. It rose nicely and browned beautifully….. this cobbler will definitely be making more appearances at Family Dinner Nights. Melt 1/4 cup of butter in the bottom of an 8″ square or 9″ round pan. Set aside. In a medium bowl mix the baking mix and sugar. Next, blend in the milk and egg. Pour the batter over the melted butter in the pan. If you’re using fresh peaches, peel, pit, and slice them. Frozen peaches should be thawed. Mix sugar, salt, cinnamon and nutmeg into the peaches. Spoon the peach mixture over the top of the batter. Bake until the top is lightly browned and the fruit is bubbling, about 40 to 45 minutes. Remove the cobbler from the oven, and allow it to cool for 5 to 10 minutes before serving.